What is Cripple Wall Bracing? Cripple walls are wooden stud walls on top of the exterior foundation. They support the weight of the house and create a crawl space. The diagram on the left shows how these cripple walls may be braced with plywood. 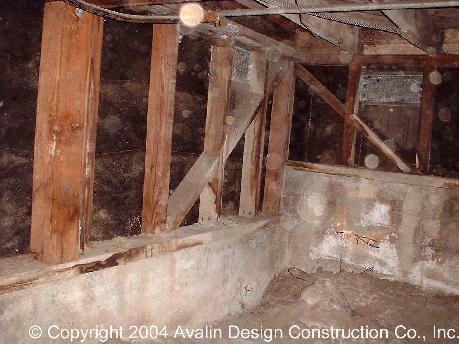 Unbraced cripple walls may collapse with the side to side swaying of the house during an earthquake, causing the house to fall. The picture on the right shows a typical unbraced cripple wall which poses an earthquake hazard. Avalin Seismic Construction Co. was hired to retrofit this house. This photo shows cripple wall bracing in progress. Note the new lumber being added as backing to create solid edges for the shear wall nailing, as well as the expansion bolts in place and the framing anchors connecting the rim joist to the top of the cripple wall. Bracing the cripple walls by using structual-grade plywood is simple and provides greater resistance to earthquakes. 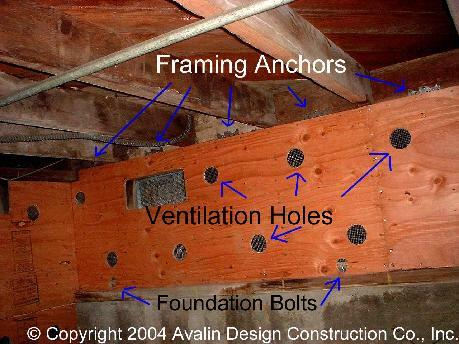 This photo shows how Avalin Seismic Construction Co. has finished the retrofitting. The cripple walls are now braced. Click here to see more photos of cripple wall bracing.